Create a cozy atmosphere in areas outside of your home with the attractive looking Stainless Steel-Plated Solar Post Cap Light. Q: What are the inside dimensions of the Stainless Steel-Plated Solar Post Cap Light? A: Yes, the Stainless Steel-Plated Solar Post Cap Light comes with a 2-year limited warranty on materials or workmanship / 1-year limited warranty on solar light components (solar panel, low voltage solar cell and LED light bulb). Do you have this same light that fits 6 x 6 posts? 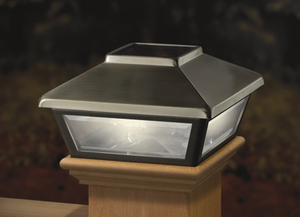 The Stainless Steel-Plated Solar Post Cap Light is only available in the 4" x 4" post cap model. We do carry 6" x 6" post caps, of which, can be found in the below Post Cap Section: https://www.earthtechproducts.com/solar-fence-post-cap-light.html Thank you for your inquiry! Thank you for contacting us! This post cap actually outputs Cool White. Thank you for your inquiry!